This is a Prey locations guide. Here you will find details on the Arboretum, including items, weapons, and secrets. The first site of Arboretum where January calls you, the site is crawling with Mimics. The area where you next encounter an unknown Typhon and a “mind-controlled” crew member. This site is found beyond the Grav Shaft. The area sits near the Green House. Head past this corridor to reach the Talos I Lobby. Check the right side of corridor to find this pitstop. 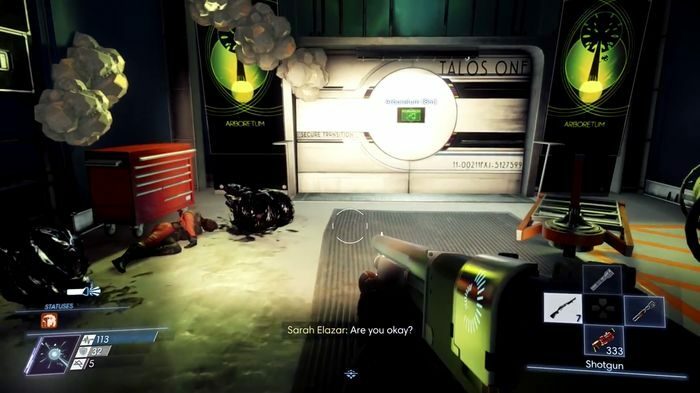 This hidden location can be accessed in one of 2 ways: either head through the maintenance access panel from the Medical bay, or break through the 2 aquarium screens from the Talos I lobby doorway. The location has an elevator bank. There are several Typhon organisms causing mischief at the site. If you proceed past the Security booth you will eventually find the Weapons Locker. Beyond the Storage AR01 door is chock-full of weapon ammunition. Access to CEO Alex Yu’s office requires some footwork. With the Grav Shaft inaccessible, you will be forced tread along steel beams. Similar to the Weapons Locker, Alex’s safe conceals several valuable supplies. Found on Jia Kyung-Ho’s corpse in Loading Bay. Found lying behind Evelyn McCarthy’s corpse at the Experimental Plants. Found at the Lobby Access. Frisk Jenny King’s corpse. Found in front of the Deep Storage. Examine near Zachary West’s corpse. Found in the Green House. Examine the supply crate next to the main entrance. Found inside Alex’s safe in Alex’s office. Found held by Edna Burton’s corpse inside the Green House. Found on the roof of the Looking Glass station. Frisk Dr. Howard’s corpse. Found at the landing leading to the Experimental Plants. Frisk Evelyn McCarthy’s pocket. Found at the Talos I Main Lobby. Frisk Henrik DeVries’ corpse. Found inside the medical bay (right of the corridor). Found in a hidden room. Break the Looking Glass station to find it lying below the shaft. Found at the Lobby Access. Inspect near Jenny King’s corpse. Found (2) inside the Deep Storage. Examine near Zachary West’s corpse. Found inside the Green House. Found inside the Secret Storage. Use Mimic Matter I to squeeze through the opening of the huge security cage and inspect Carin Buckley’s corpse. Found inside a locker in the weapons locker room. You need to unlock the door marked “AR01” with the code given by Rani. Found (2) inside Alex’s safe in Alex’s office. Cultivated in the Experimental Plants Garden. Part of the Gardening Tips Objective. Required to unlock the TranStar Gourmand achievement trophy. Found at the Arboretum Foyer. Frisk Henrik DeVries’ corpse after the technopath battle. Found inside the Green House. Inspect the workbench. Found inside the Deep Storage (Entrance). Frisk Zachary West’s corpse. Found along the path to Alex’s Office. Frisk Marietta Kyrkos’ corpse. Found along the path to Alex’s Office. Frisk Marietta Kyrkos’ corpse and listen to the audio recording. Found in Alex’s office. The panel is obstructed by a crate. Use the code sent by December back in the Neuromod Division. Found one hiding next to Jia Kyung-Ho’s remains in the 1F Loading Bay. Found one hiding in the Supply Closet. Found a couple landing from Looking Glass station’s shaft. Patrols along the path past the unpowered door. Found while scanning by the window of the Greenhouse. Found 2 at the entry to the Crew Quarters. Found one guarding the elevator bank in the Arboretum foyer. Found inside the Secret Storage. Found close to the weapons locker/ shafts down the path leading to the Deep Storage. Found 2 in the Arboretum foyer. Found inside the security booth.